From JULY-2014 RR CAREER CONCEPT is a Authorised Input node for submission of IELTS Test Application forms for IDP: IELTS Australia. IELTS accepted in foreign education world. The IELTS exam is the most important test to get admissions in the university of your choice. We help you do that! We also provide coaching in Spoken English and other areas. 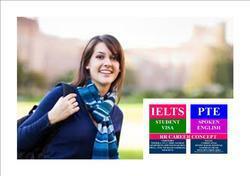 Free IELTS and PTE coaching to all registered students. We are a unique name in the industry to provide our esteemed clients the best quality IELTS Training Service. The provided service is rendered by our skilled team of professionals in the best possible manner to gain maximum clients satisfaction. We render this service to train our reputed clients for clearing IELTS examination. Since 1997 EEC has helped thousands of students in Vadodara prepare for entrance exams of IELTS, TOEFL, GRE, GMAT, SAT and Spoken English classes, French Language Classes. - Fully AC classroom with suitable & comfortable seating arrangement. IELTS Study Abroad Coaching.For Education, Immigration and Work Permit for.Canada, USA, Australia, New Zealand, UK and Europe. We also offer coaching in all four skills (Listening, Reading, Writing & Speaking for both IELTS as well as TOEFL. Our coaching for IELTS & TOEFL is virtually on one to one basis.